Have you ever wanted to do a chocolate course? 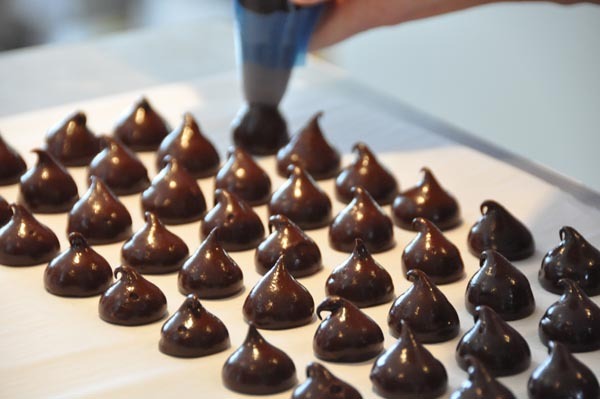 Wondered what tempering chocolate was all about or how to make ganache or truffles? As some of you may know, I have been struggling with tempering chocolate for a long time now. Occasionally it’s worked, but more often than not it hasn’t and the chocolates I’ve made with love just don’t look very good. Not only that, they don’t last very long and I don’t mean because I have scoffed them all. The chocolate is dull and often produces a white bloom after a couple of days. This not only looks unappealing, but just doesn’t taste right. So when given the opportunity to attend a morning’s chocolate session with Cornwall’s top chocolatier, Nicky Grant, I was determined to attend. Nicky Grant, patissiere and chocolatier, has won several awards for her delectable fresh handmade chocolates; I’ve tasted them on a number of occasions and reviewed them here on my blog. Flavours I haven’t tried yet but am particularly keen to include, cardamom & pistachio, lime & chilli, honey & cinnamon and Cornish Blue & port. Nicky’s fennel & ginger won an Academy of Chocolate Gold in 2011 and her Cornish seasalted caramel, which is to die for, won a Gold Great Taste Award. Behind every great woman there is a great man and husband Tom is sous chef and business manager. The couple have recently branched out into hosting bespoke chocolate courses. If you want to learn a specific aspect of chocolate making, cake making or decorating, give them a call. For those unable to attend a course in a remote (but very lovely) part of the country, there are plans afoot to run various courses online. We all know that Cornwall is God’s own country, but it was a thoroughly awful day weatherise. The cold driving rain, made for an unpleasant journey, but the allure and aroma of melted chocolate soon eliminated all other thoughts. A select band of Cornish bloggers along with a journalist and photographer gathered in the Grants’ farmhouse kitchen and dried out in front of the Aga. Nat of the HungryHinny I knew, but the others I was meeting for the first time: Rachel of Saffron Bunny, Sadie Phillips from Cornwall Food and Drink, Jessica of FishWifey and journalist Eleanor Gaskarth. Tom is knowledgeable and quite passionate about the science behind chocolate. Nicky is the artist and creator of flavours and is highly adept at her chocolate craft. Both were very keen to impart their knowledge and expertise. In the short time we were with them, I learnt loads and now have a much clearer understanding about how chocolate works. We listened, asked questions, watched, tasted and then got to play with chocolate. The session was divided into three main parts. I am not going to include everything that was imparted to us as that would be a book in itself, but I’ve noted one particularly useful tip for each part. Tempering – The transformation of chocolate from molten goo to a stable, shiny substance, that has a good snap to it. This is very temperature dependent and if you don’t get it right, your finished chocolate is likely to develop a white bloom, look dull and have a rubbery consistency. It’s all to do with polymorphism, Tom’s favourite word. What this means is that chocolate can take many forms depending on how it is treated. Top Tip – Test the chocolate before using. Dip a piece of greasproof paper in the chocolate and leave it for a few minutes. If it is tempered you will soon start to see the chocolate crystallising and in about three minutes it should be set and shiny. The chocolate will continue to crystallise for the next 48 hours. What you’re after is Beta 5, apparently, chocolate in its perfect state. Untempered chocolate will take ages to set, we did two strips and compared them; it was easy to see which one was tempered and which wasn’t. Tasting – We, er, did get to try some chocolate whilst we were there. A high cocoa content milk chocolate is my favourite so I was delighted to be trying a Venezuelan 44% milk – it was truly good. A dark 73% was also rather good and not particularly bitter. Top Tip – 11:00 is apparently the best time of day to taste test as that is when our tastebuds should be at their optimum. Making Chocolates – We left the cosy kitchen and headed for Nicky’s chocolate studio. There we saw how to make ganache and how to pipe it, including how to fill a piping bag which is something I always struggle with. Nicky did a demo of how to make a piping bag out of paper – she made it look very easy, but I suspect I’ve already forgotten what to fold and where. At this point we were allowed to get our hands dirty and we all had a go at rolling the dark tear drop ganache shapes in cocoa powder (Red, Extra brute). We then dipped the milk chocolate ganache forms in tempered milk chocolate and rolled them in milk chocolate shavings – what a pleasure. Top Tip – Making ganache seems to be a hit and miss affair with me, my ganache splits as often as it doesn’t. I learnt that the varying temperatures of ingredients and implements might be one of the causes. This could explain why it happens so often to me; it goes back to my kitchen again where the cold implements probably give the ganache an unwelcome shock. We were told there are two ways of rescuing split ganache: 1) cool the mixture and whisk with a balloon whisk, 2) add a little additional hot cream to the mixture and whisk with a balloon whisk. As it happened, the ganache Tom was making split and he was then able to demonstrate the first method – to my amazement, it worked. I have yet to put the tips I learnt into practice, but I’m actually looking forward to my next tempering experience. As I suspected, my kitchen makes working with chocolate particularly difficult as it is usually too cold in the winter and too hot in the summer; the ideal working conditions are a temperature between 18C and 20C and a humidity of less than 70%. Working in the studio was a feast for the eye, beautifully crafted chocolates, Easter eggs, and decorated cakes covered virtually every surface. The massive tray of melted chocolate was so inviting I just wanted to dive straight in. How Nicky and Tom remain slim is a mystery, although they did say something about intensive workouts. I must try this myself. Thanks to Nat for organising the course. Getting five busy bloggers and a journalist to agree on a date which would fit in with Nicky and Tom was quite a feat in itself. Thanks also to Sadie who kindly allowed me to use some of her photographs – she’s a much better photographer than me. And of course thanks to Nicky and Tom who generously gave of their time, expertise and chocolate. I’ve also been too intimidated to try this. After reading ‘Chocolat,’ the desire was strong but alas, I fear it will be a disaster! How brave of you! Excellent write up! So glad we managed to find a day everyone could do… Look forward to hearing how your next chocolate making attempt goes, hopefully all the tips will help! I can never be bothered to temper my own chocolate – I’d rather spend the time baking and leave it up to the professionals with so many gorgeous shops in London. That said, I’m sure people say that about cakes and baking too! This looks like a fab course – if I’m ever in your part of the world I may just have to book myself in! Very informative and interesting post. I see, there is often a lot more to it doing things right.